Founder and President Anthony Bennie says his company will vigorously defend its federal trademark rights to the exclusive use of the SLIDERS® brand name in the pet food and treats industry. After fighting the battle to educate consumers as to what truly healthy pet nutrition looks like, now we have to fight another battle, this time to defend one of our own brand names. Clear Conscience Pet is a natural pet nutrition company, known in the American pet food industry for their lines of natural and organic pet treats as well as holistic pet gravy mixes used as dry pet food toppers. The company’s website lists many awards and recognitions received since the family-owned company launched in 2010, and also features numerous testimonials from happy customers, many times with letters and Facebook postings alleged to be coming from dogs or cats themselves. But small family companies like Clear Conscience Pet must battle for every bit of their market share in an industry dominated by large corporations such as Nestle Purina, Procter and Gamble, Colgate Palmolive, Mars, Del Monte, as well as larger independent companies bolstered by private equity investment. Startups and early phase players face a barrage of big company pet food and treat advertising in both traditional and internet media. Facebook and Twitter are major arenas for pet lifestyle targeted consumer engagement campaigns. The result is intense competition for a company like Clear Conscience Pet Now the company is facing a new challenge- a competitor is using one of their pet treat brand names and has refused to stop doing so. 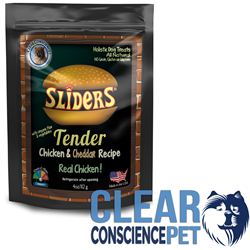 That brand name is SLIDERS®, a name for which Bennie was awarded the federally registered trademark in the pet food and treats category in 2010. He has used the name in commerce continuously since that time. This puts the company in a position where they must defend the trademark, since the government is not responsible for “policing” trademark use; this falls into the tort system and it’s a tough game practiced by specialized private attorneys. The company has defended the trademark successfully in the past without litigation, but this time, the other party is resisting. They feel that the SLIDERS name is generic in describing small sandwiches and thus not worthy of trademark protection. Bennie says that the fatal flaw in this argument is that the SLIDERS® brand is not a product description. It’s a trademarked brand name for a family of healthy pet treats and gravies that evokes a lifestyle. “There are several varieties of our SLIDERS brand® treats, with more on the way, but none of them are miniature sandwiches. The last time I checked, we’re not putting any tiny little buns in the bags, either,” said Bennie. Clear Conscience Pet® is a multiple award winning company that creates holistically balanced innovative pet nutrition products. Through its CleanLabelPet™ initiative, the company is leading the pet food and treats industry as the first company to align with the emerging international “clean label” movement. Clear Conscience Pet products (clearconsciencepet.com/products) include SuperGravy®, the first Holistic Instant Dry Gravy Mix, the Sliders® brand of holistic dog treats, the patent pending OSV™ dog treat and chew line, and Cruncherz™ 100% Organic Gluten & Grain-Free Bakery Treats. The company is based in Wilton, Connecticut and is family-owned by Founders Anthony Bennie and Amanda Malone Bennie. They currently market their pet food products to pet supply retailers, veterinarians, health food stores, and other pet specialty outlets.